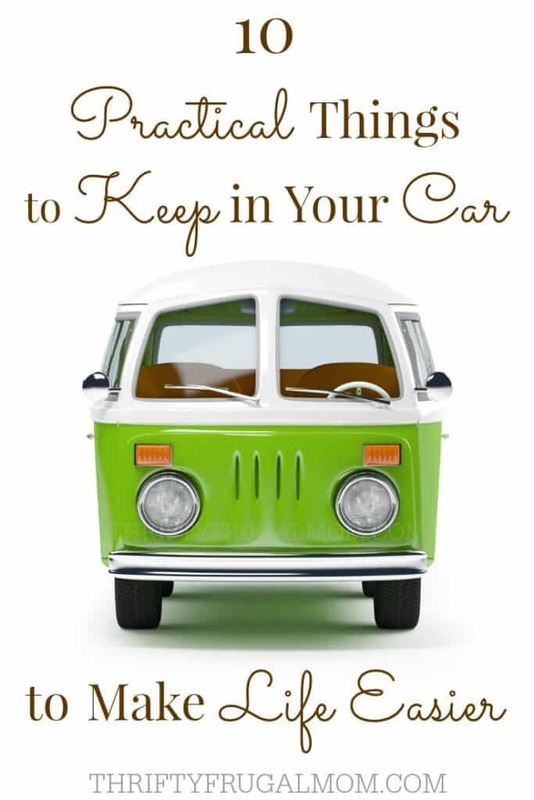 Family travel doesn’t have to be stressful! 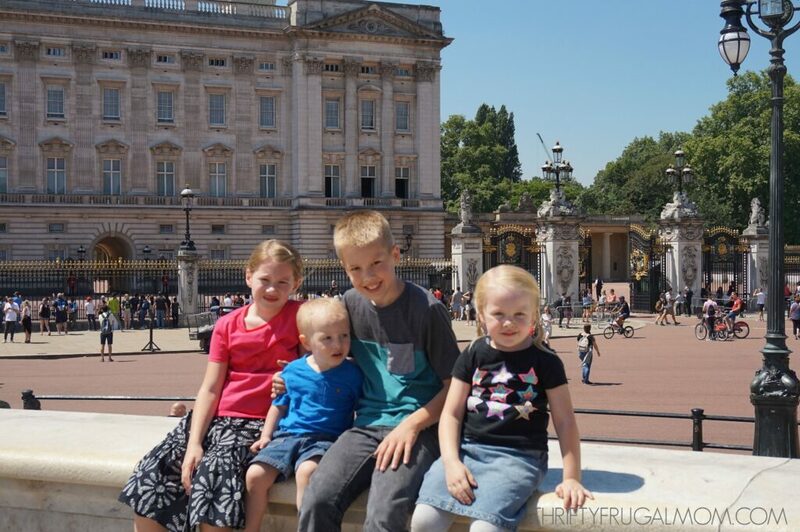 These 11 simple things helped us have a stress free family trip to England…and they can help you enjoy a stress free family trip too! 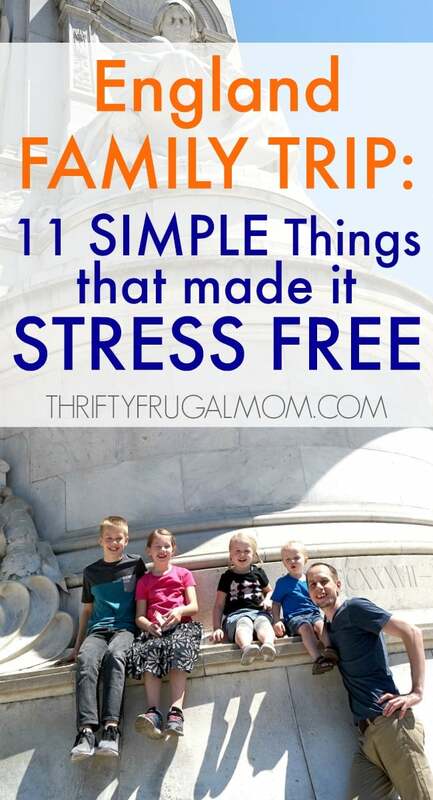 I’ve never been one of those people that wanted to travel the world, or even the U.S., with their family- because goodness, it just seemed way too stressful! But earlier this year an opportunity kind of dropped into our laps that allowed us to take our family of 6 to England for 3 weeks with nearly all expenses paid. Obviously it’s sort of crazy to not take advantage of that, right?! Besides, we kind of needed to do the trip since it was related to my husband’s schooling and would help further his chances of getting into a good PhD program too. Even though I knew it was an incredible opportunity and I was excited, it also looked pretty big and overwhelming too. 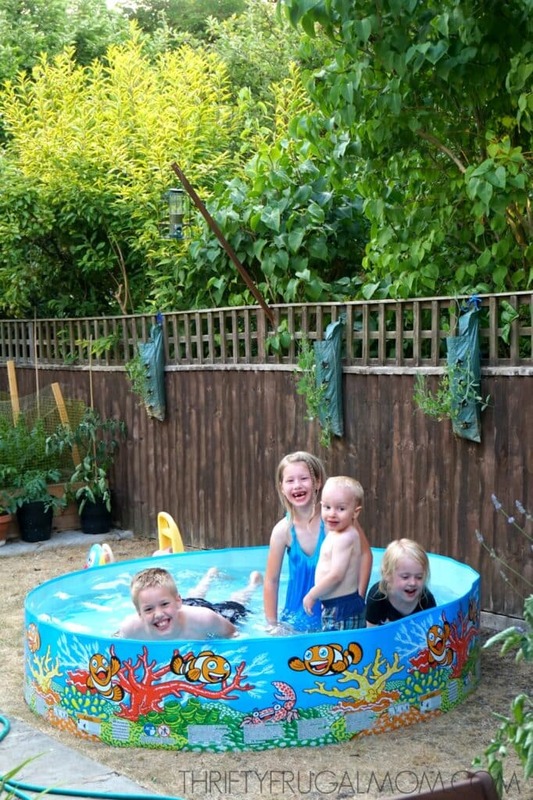 I was a bit worried that instead of it being a fun time of good memories for our family, it would end up feeling stressful, especially because we were trying to do this on a tight budget. But guess what? We had the most wonderful trip! Yes, there were a few small moments of stress here and there, (like when I left my diaper bag on the bus! ), but that’s life, right? Overall, it was a family trip that was pretty much everything we had hoped for. 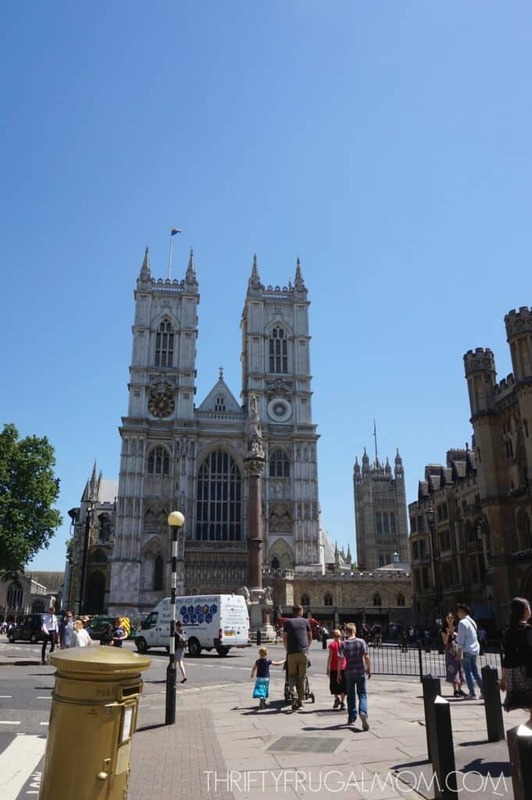 And I’m convinced that the preparations we did before our trip were a big part of the reason we had such a good time once we actually got to England. Of course, having low expectations about how things would go definitely helped too. But making it a point to take care of lots of little details before we left, really was so key! So what did I find especially helpful? Here you go! A couple of weeks before our trip, I started two lists. One was a list of things to take along and the other was a list of things that needed to be done before we left (errands to run, things to buy, bill to take care of etc.). I brain dumped on my lists right away, and then throughout the next several weeks, as I continued to think of things that I wanted to be sure to take along or that needed to happen before we left, I’d take a few seconds and quickly jot them down on the appropriate list. Another thing that almost seemed silly, but was super helpful, was to make a detailed list of items to pack for each person (shirts, pants, underwear, socks, pj’s, toothbrush etc.). I guess I’ve learned the hard way that when you are packing for multiple people, it’s just way too easy to miss something! These lists helped free up my brain and reduced my stress level significantly! And I was pretty happy when I realized that we hadn’t forgotten a single thing- no small feat when you are traveling for three weeks as a family of 6! I decided to plan to basically do nothing but pack and prep for our trip the two days before we left. In fact, I tried to keep the whole week pretty low key. At first, I thought maybe I was being a little ridiculous. Wasn’t two full days kind of extreme? But in the end, I was so glad that I did it! It gave me time to do up all the laundry, pack everything that the kids and I would need for the trip, tie up other last minute thing like taking all of my house plants to the neighbor so that she could care for them while I was gone, tidy up the house and not be totally exhausted and stressed out before we even started our trip! And we all know that if momma is stressed, the whole family feels it. 🙂 So in the end, it felt like it was one of the best decisions that I made! I knew it would be a pain, both literally and figuratively, if my husband and I ended up trying to carry all the things that everyone needed while traveling. So I decided to invest in a backpack for every family member (except for the youngest…we took our diaper bag for him). Our kids weren’t very old (almost 10, 6 ½, 4, almost 2), but the three oldest could easily handle their own backpacks and that ended up being a huge lifesaver! They each carried their own water bottle, a change of clothes, a couple of snacks and then a several things to help keep them entertained when they got bored- books, dolls, paper/pencils, coloring books/crayons, crossword puzzle books, etc. This meant that my husband and I could pretty much use our backpacks for just our own things, which was so nice! Well, I did have to carry a few family related things such as Wet Ones, Band-aids and the like, but still, I mostly had space for the things that I really needed for myself. Speaking of backpacks, I actually didn’t own a one before our trip. I had been eyeing a few leather ones though, and our trip was the perfect reason to go ahead and get one! 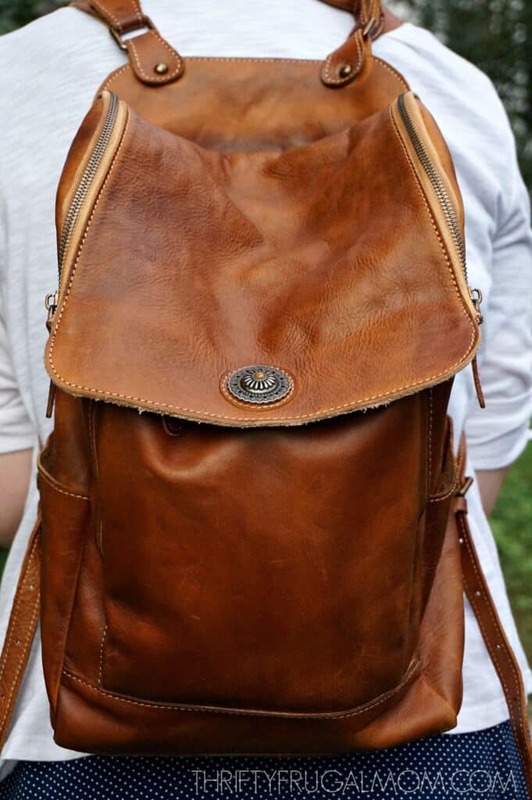 This classic leather backpack from Rock Cow leather is what I ended up with- it sold me in part because it was much more reasonably priced than most leather backpacks! I loved having a classy looking backpack to use, especially since we were out and about in the both Oxford and London quite a bit. And I really liked that it had a number of pockets too- definitely made it much easier to be organized! The only thing that I hadn’t anticipated was the fact that it was a tad smaller than traditional adult backpacks, and because it’s leather, there’s no give. Since we were obviously trying to pack light, taking lots of books along just wasn’t a smart move. I already had a number of ebooks loaded to my phone’s Kindle app, but decided to also try a free 30 day trial to Scribd so I could listen to books when that was more convenient, as well as have a bigger selection of ebooks. The combination worked really well, and there were plenty of times that I was grateful for the audio book option instead of being stuck with just ebooks. And I ended up liking Scribd so much that I became a paying member after my trial ended! Click here to get your free 30 day Scribd trial! It’s a cheaper alternative to Audible and has loads of audio and ebook selections. Band-aids : Kids = lots of ouchies! FelsNaptha soap: My kids are prone to getting clothing stains and this bar soap is my go-to stain remover. I was so glad for it when I was doing laundry there! Onion Chopper: I hate chopping onions with a knife! When I’m at home, I love using my Vidallia Chop Wizard , but it kind of feels a little bit big to take when you are trying to maximize your space. 🙂 Luckily, I still had the little hand held Tupperware chopper that I used before I had my Chop Wizard, and since it’s so small, I was easily able to tuck it in my suitcase. It was so handy when I was prepping food! Washcloths: Europeans don’t use washcloths, so any hotel or Airbnb you stay at isn’t going to provide them for you. I knew that with kids especially, it would be a whole lot easier if we had washcloths along! Before we left, I downloaded XE Currency, an app that makes it easy to figure out the exchange rate and what your money is worth in another country. We were on a pretty tight budget and it was super helpful to be able to easily figure out exactly what we were spending in US currency. This one actually happened by accident. Originally we were going to only take along three UK outlet adapters, but somehow in the course of ordering things for our trip, we ordered an extra set. It ended up being a blessing in disguise. Between computers, cellphones, sound machines for the kids etc., we ended up using all six adapters! Plus, it was awfully handy to just be able to leave one adapter upstairs in our bedroom and not always be running back and forth to get it when we needed it. It’s a small thing, and I know we could have made it work with only three adapters, but it did really make things a little easier and less stressful. If you haven’t traveled internationally, you may not be aware that other countries have different styles/voltages of electrical outlets. As a result, the US style of electrical plugs won’t work in other countries unless you have an adapter. 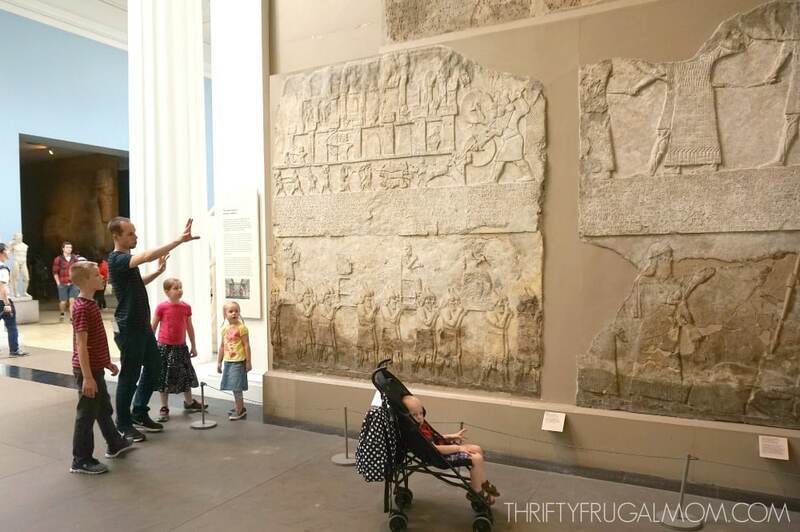 It also meant that the kids and I would be spending a lot of time wherever we stayed and we needed to think about ways to keep them entertained. We decided to use Airbnb, which was the best choice ever! But we were super choosy and looked for a long time before we found places that fit both our budget and our needs. 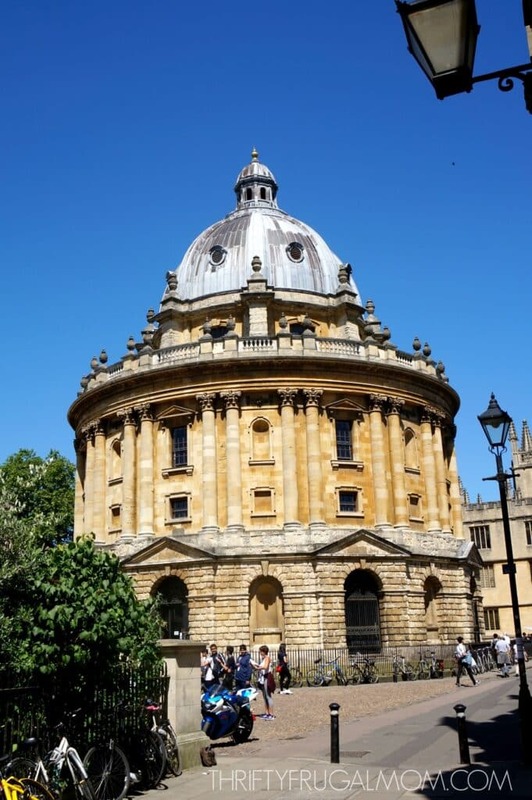 The listings we went with though, both in London and in Oxford, ended up being just perfect for our family and I was so glad that we made the choice to spend a lot of time looking for the right places. Because even though it felt super frustrating to pour over Airbnb locations for what felt like days, in the long run, it was a really good investment of our time! In both places, we were able to stay in the home of a family that was on vacation. This meant that the kids had toys and things like a trampoline, kiddie pool and sand box. That was such a huge blessing! Click here to get $40 to give Airbnb a try! It’s pretty much all we use anymore when we travel or do vacations. 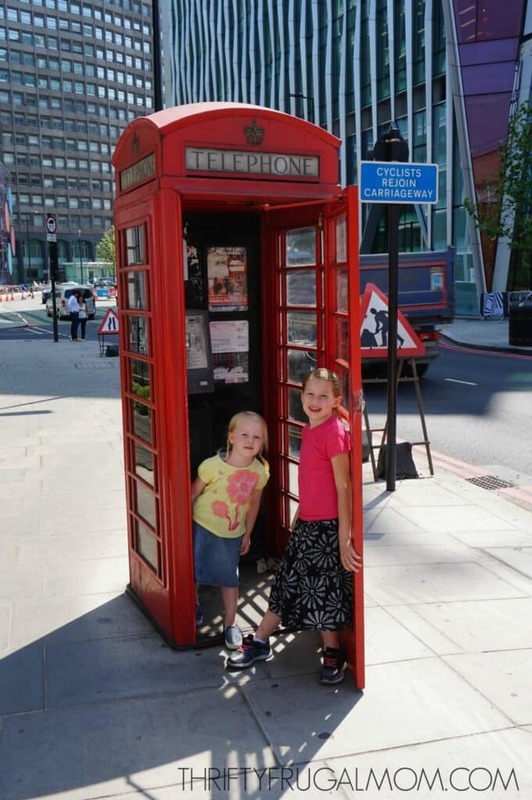 This might not be for everyone, but we decided to not rely on GPS, partly because we find it annoying (we’ve had numerous experiences where it has taken us in circles) and partly because we decided to save money and not pay for cellphone service while in England. Instead, we bought maps on Amazon ahead of time, one map of London and one map of Oxford. We could have waited to get our maps until we arrived in England but it would have been more hassle and more expensive too. And honestly, even if we had used GPS, I think we would have liked having the maps because it just helped us have a better idea of what was where and which places were near each other. Trying to get cash changed to local currency or even constantly needing to think about withdrawing money to have on hand can be a hassle. And then of course there’s the confusing thing of trying to figure out the value and names of local currency too. Our solution was simple: just use credit cards. There were a few times that we needed to have cash and had to withdraw a little, but 98% of the time we could just use our credit cards. It was super convenient! And it was also nice to not have to worry about figuring out what to do with a bunch of foreign money when we were ready to head back home. One word of advice though- get a credit card(s) that has no foreign transaction fee, otherwise, you’ll typically end up being charged a small fee with every transaction! With 4 curious little kids, and at times several pieces of luggage/bags too, it was a bit of a challenge to keep track of everything when we were moving about! From the start though, in crowded areas, we used a system that ended up working really, really well for us. My husband would take the lead, the kids went next and I came last with the stroller. The kids knew what to expect when we started walking, it made it easy for me to keep my eye on everyone and see if someone got distracted and momentarily strayed away and it allowed my husband to focus on navigating us to where we needed to go, without a lot of distractions. What are your tips for traveling with kids? I’d love to learn from you! I loved reading about your family trip, Lydia! Brings back memories of family trips when our family was young. Blessings to you and yours! Thanks, Gina! And I love that you can still relive the memories from those trips. It convinces me even more that these kinds of things are worth the effort it takes to do them!